I’m in Haines, Alaska now to photograph grizzly bears feeding on salmon in the Chilkoot River, just outside town. In the three days I’ve been here, I’ve talked to a number of town folk, park rangers and others. My comments are based on those conversations as well as my own impressions and experiences. 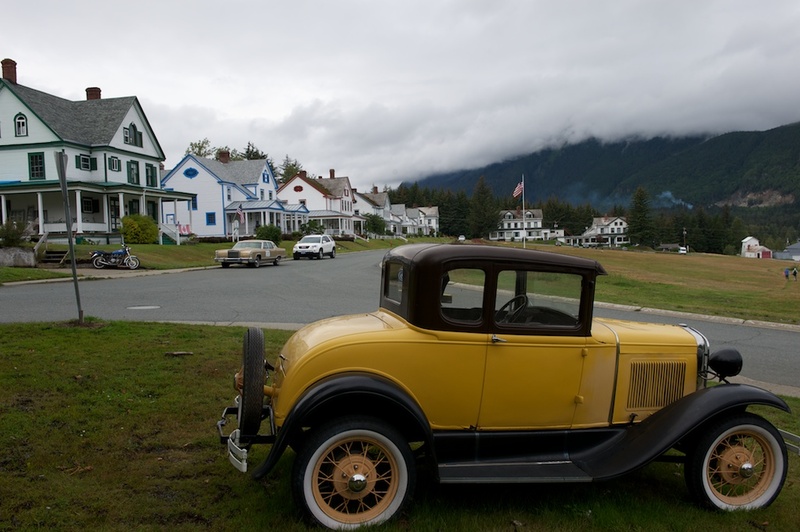 Haines is located on the coast, just a ferry ride from Skagway. Both towns cater to cruise ship tourists, but while Skagway has blossomed economically from that trade, Haines has been left in the dust. Not that Skagway is good and Haines a bad place to visit. If you have ever been to Skagway by ship you know that to some it can look at times like a honky tonk town, full of trinket and tee shirt shops. Haines only welcomes one or two ships a week and they tend to be somewhat smaller than those visiting Skagway. The town is a favorite for winter vacationers from Canada’s Yukon Territory as it is due south and its coastal location moderates its weather, a welcome relief to frozen Yukoners. During the annual salmon run the bears compete head to toe with anglers that line the banks of its rivers. In fact, the bears have learned to steal the catches from the fishermen. But the town has seen better days, for sure. The local timber mill closed down years ago, jobs are scarce and times are tough as witnessed by the number of homes for sale and boarded up stores. 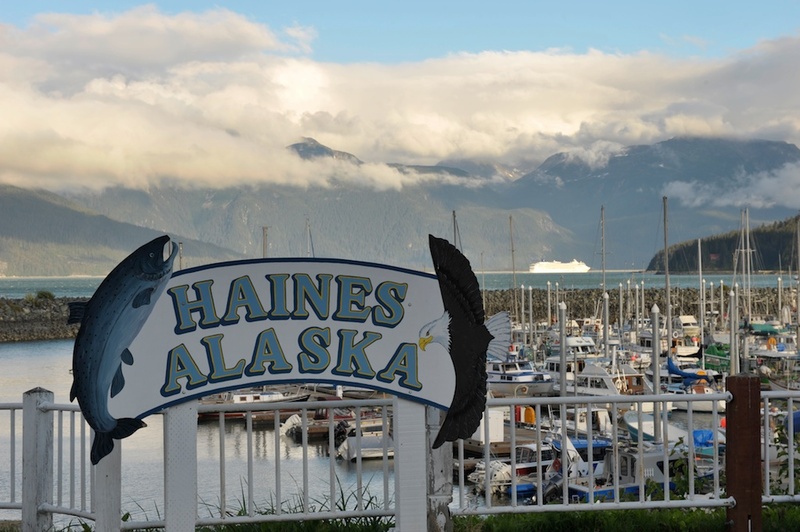 The population in the entire borough of Haines is around 2,000 people. Haines is named after a woman who donated money to create a mission here to convert the Tlingits, the native population. 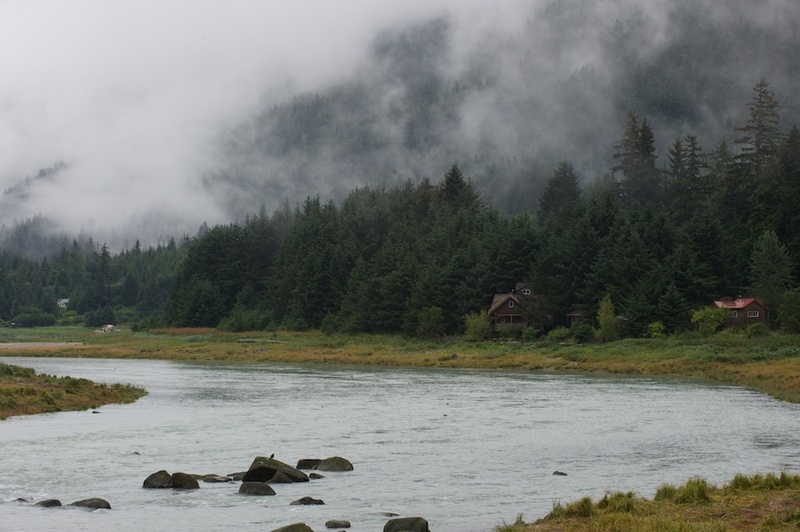 The Tlingits referred to the area as “the end of the trail,” because of it being the end of their inland trading route. Once the United States bought Alaska from Russia and subsequent land disputes with Canada were settled, Haines became a major military installation that dominated the region and the economy from the turn of the century to just after WW II. The dismantling of what was known as Fort Seward was a blow to the region. The American Bald Eagle Foundation is headquartered here and sponsors the annual eagle festival in November. During the winter months Haines has the highest concentration of bald eagles in the world and attracts lots of nature lovers. Similarly the annual salmon run attracts thousands of visitors. Haines also attracts thousands of adventurers who love outdoor pursuits including kayaking, mountain biking, fishing, canoeing, hunting, camping hiking and photography. A number of outfitters in town cater to that crowd. If you are into any of these sports, I advise you to keep away from the two terrific outfitting stores in town because you’re bound to spend more there than you anticipated. Accommodations tend to be modest. There are several nice restaurants in town. My favorites were The Chilkat Bakery & Restaurant for breakfast and the Mountain Market, an organic/alternative market and restaurant for lunch. Dinners were a mixed bag. On the one hand we had a good dinner at Mosey’s Cantina, a Mexican restaurant. The Bamboo Room and Pioneer Bar is known for its fresh fish and chips, which were terrific, but its other dinners were mediocre at best. One “Salmon Special” was so awful I had to send it back. The wait staff, however, was exceptionally friendly and efficient. The one thing that came as a surprise to me was the cost of food here. From groceries to restaurant meals, things are expensive. A fish and chips dinner, for example, is $25, without drinks. However, the portion sizes are huge and easily shared by two. 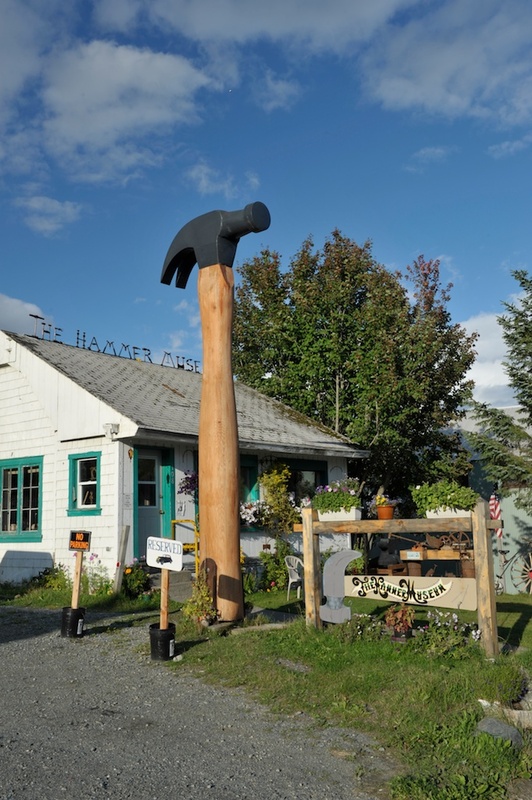 As you might expect, Haines has some solid and some quirky cultural attractions. First the quirky: how about The Hammer Museum. No, it’s named after a person. This is a museum devoted entirely to hammers! 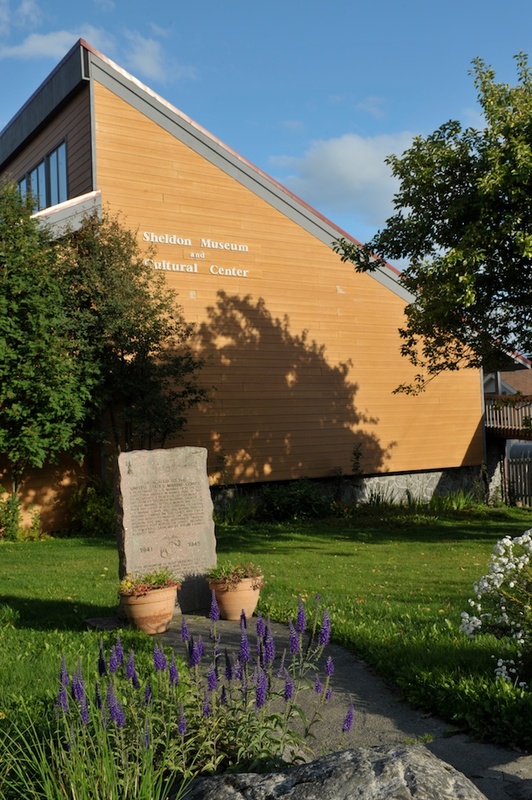 There is also the Sheldon Museum & Cultural Center which features local history and native culture. The American Bald Eagle Foundation maintains both a museum and rescue center where you can see live bald eagles. The waterfront area is strikingly picturesque, with ocean and snow-capped mountains in every view. The views and wildlife attractions around Haines are incredible. Drive a few hundred yards from town in any direction and you’ll feast on eye candy. Bald eagles are everywhere, bears roam the roads, forest and shoreline at this time of year, and seals swim upriver to feast on the salmon. We saw black mink, many bird species, and dozens of waterfalls. The weather is chilly and often misty or rainy right now, but if you are the outdoors type, I’d easily recommend Haines as a vacation destination.